Went to Clydebank last night, to the dubious Empire multiplex (next to the really scruffy but surprisingly excellent Shanghai Express restaurant) with Mag and Laura to see the new Mickey Rourke flick The Wrestler, which is, as Springsteen's song says over the closing credit, a one-trick pony of a movie. Two tricks, actually. Turned by Rourke, much praised for his turn as, ahem, Randy The Ram, and the even better Marisei Tomei, who is in fact absolutely phenomenal. Compare and contrast her approach to single-mum-pole-dancer-with-heart-of-flint to the horrendous attempt at an almost identical role by Demi Moore in Striptease. The film itself is a slight wee thing: Over the hill grappler with horrendous personal life can't give up the game, despite heart bypass surgery (!). and....that's it, really. There's an estranged daughter and the aforementioned dancer, Pam/Cassy. The details are great, though. I will flinch from now on every time I see a staple gun. The deli counter scenes are only ever heading in one, unnervingly bloody direction. The Jersey boardwalk is straight from The Wild, the Innocent and the E Street Shuffle. And Rourke, once the prettiest boy on the block (Rumblefish, which is magnificent, Angel Heart, and the risible 9 and a Half Weeks) acts out his own fall from grace (descent into substance-fuelled madness, a daft attempt to become a boxer, dreadful plastic surgery) mercilessly. There's no beauty left. Just acting ability. The gang of lads in front of us, who were, let us say, suspiciously chatty throughout, were not impressed, shouting abuse at the ending and at cinema staff on the way out. Although they liked the wrestling match with the staple gun (and barbed wire, broken glass, ladder, tables, chairs etc). Mick McManus it wasn't. Raging Bull (comparisons have, crazily, been made) it most certainly wasn't. A bleaker Rocky, without the thrills, maybe. All of this was spinning around my mind this morning as I donned a boiler suit and rubber gloves and began clearing the bottom of Magnus's close of an entire houseful of someone else's rubbish. There since Christmas, none of the other residents had attempted to shift it. Complaints to the factor had borne no fruit. Notices on the front door had provoked no reaction. I'm off home tomorrow, hurricanes permitting, and felt I couldn't leave the offspring in danger of verminous infestation or fire. It took half an hour to clear the rotting takeaways, hundreds of bottles, boxes, and general detritus. Whatever happened to pride in tenemental living? the legendary community spirit of the close? When you live in a place like Shetland, it's easy to romanticise the appeal of the city. This week's stay in Glasgow brought back all the memories of what life here could really be like: the grinding bureaucracy involved in getting anything (like shifting dangerous rubbish) done; the difficulty and expense of finding tradesmen to do stuff to your house; waiting in for hours (I'm here from 12 until four in the fervent hope of a washing machine's arrival); the horrendous state of the roads (potholes deep as Australia), the sheer unhealthiness you see on so many faces. The traffic. The dirt. The crime, and lurking sense of threat, even walking to Tesco. Still, friends and family are here, and it's always great to see them. And you can get to the movies. The Wrestler is worth a trip to Clydebank. Hey, there's a 24-hour Asda nearby! 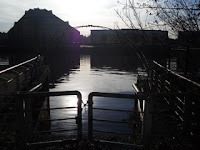 A beautiful day in Glasgow, and after too much morning coffee with old mate TC, it was time for a stroll along the river to work. There's so much work going on (and weird bits of the riverbank which appear to have been privatised) that you end up weaving in and out of bollards, JCBs, parked cars and some of the worst-designed apartment developments in history. But there are little joys, like the old ferry steps, preserved here for some reason, and never to be used again. A PQ, they've lost the 'l' out of Scotland. Where can it possibly be? I wondered briefly if a pound sign was going to installed as a comment on the SNP losing its budget vote, but perhaps not. Tonight, I was supposed to go to the Ramblin' Boys gig at Celtic Connections (I'm doing a majorly major interview with Arlo Guthrie tomorrow) but no press pass awaited me. Too many decades hustling for free entry to gigs suddenly caught up with me, and I explained to the woman on the desk, who was all set to start telephoning senior executives, that, frankly, I'd rather just go home and have an early night. Sleep tight! It was Mic Calder who reminded me of the 1969 Lulu show, in which, inconceivably, the Jimi Hendrix Experience was allowed over nine minutes on peak-time Saturday BBC TV to demonstrate to the entire UK why our lives and our music needed to be entirely different. I remember the blue carpet, Brownie the dog, Stewart Howard, Jim McClurg and David Cowan being there...my mum being utterly shocked....and the bit you don't see in this clip, a truly flustered Lulu trying to get the show back on track...I was 13. Later, I took Magnus and Laura out for dinner to the new La Vita Spuntini 'Italian tapas' restaurant which has opened in Byres Road. Amid, it should be said, some critical approbation. My old acquaintance (and sometime barman at the Phoenix in Inverness) Ron McKenna had mixed feelings in the Herald (can't find it online), while Allan Brown absolutely flamed it in the Times. We took the Mckenna advice and stuck mostly to pizzas and pasta. The pasta was wonderful, the pizzas fine. There was a slightly odd tortilla but the chicken liver crostini was splendid. It's not dear, the service was good. I'd go for it, but avoid anything on the menu which mentions "trotters"...as, let's face it, is probably wise on any occasion. I have the Phenergan, however, and I know how to use it (just ONE tablet or it's comatose broadcasting for the rest of the week). 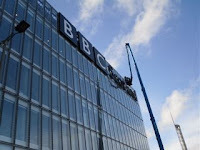 I'm heading for Glasgow, there to meet up with family and friends, do the show from Pacific Quay, and catch some Celtic Connections action, hopefully, as well as this extraordinary site-specific thing at the Citz, Sub-Rosa. And interview at some length Arlo Guthrie, for my Musical Genes series. 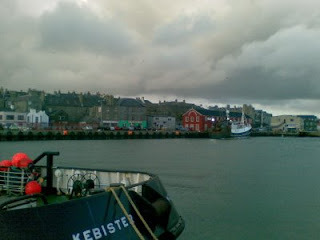 The scene from the Victoria Pier in Lerwick earlier today. One of the benefits of being in Coalfishreek, the Capital of All the Shetlands is being able to revive the ancient habit of ship-spotting. Not much in the town bit of the harbour but a dirty great oil survey ship and the Banff fishing boat Searcher, just getting ready to hotfoot it for the fishing grounds. Now, chips! I just got a new compact digital camera in the Amazon sale (a Samsung S1070, 59 quid, much more expensive now!) and decided to see how its movie facility worked...this is a pretty rough compressed QuickTime version...and I think YouTube have removed the Beach Boys soundtrack for copyright reasons! Anyway, Susan and I went off for a walk at Eshaness in much milder conditions than anticipated. Last night's predicted hurricane never arrived, though the aftermath provided a really spectacular walk. We went along to the Grind o'da Navir, which is where the really big waves are hitting towards the end of the video. And we NEARLY saw The Cannon blowhole below the lighthouse erupting! I've just about finished Roberto Saviano's astonishing book Gomorrah (the movie is set for a foreign language Oscar) which is subtitled 'Italy's Other Mafia' and is a journalistic....immersion is probably the best word...in the world of the Camorra, the Neapolitan 'mafia' - a 'system' (Saviano's word) at least four times bigger than its better-known Sicilian equivalent. According to Saviano, the UK HQ of the Mondragone Camorra was and is, well, Aberdeen. He's worked in the city and claims its entire tourism and recreation sector was rejuvenated by Camorra activity. Help ma boab! It's an amazing book, by turns jabbering, ranting, coolly factual, phenomenally detailed, objective and furiously partisan. It has, almost by itself, spawned the description 'Unidentified Narrative Object' to describe its style, though frankly it's not a spit away from Hunter S Thompson's best work (notably Hell's Angels and Fear and Loathing on the Campaign Trail). It has the same rage and the phenomenal observational ability. But not the joyous consumption of mood altering substances. Anyway, here's an interesting column from the Hindustan Times about the book. For me, reading Gomorrah comes hot on the heels of another journalistic tour de force, Generation Kill, Evan Wright's story of his 'embedding' for Rolling Stone in the US Marine Corps during the most recent invasion of Iraq. Wright's approach is in a recognisable style of American 'personalised' journalism, owing a great deal to the 'new journalism' of Thompson and Wolfe, but endeavouring all the time for the kind of objectivity we would recognise as 'factual reportage'. Wright has been heavily criticised by some of the 'characters' in his book, particularly the officers, especially since the advent of the TV series based on it, made by the people behind the much-lauded (by me!) The Wire. He's been accused of disguising third-hand stories as first-hand reportage, and of accepting the (highly coloured) views of the soldiers he was embedded with as fact. Saviano defuses such criticism by leaving the nuts and bolts of his style very visible: the book's astonishingly grisly opening, which reads like personal observation (and is very like a scene in series two of The Wire), is later revealed as a tale told to him by a crane operator. All the way through, though, the shifts from personal grief to hard-nosed grafting hackwork are made very clear. And the book's personal context (Saviano has not been sued, has been awarded numerous prizes, but is under threat of assassination) validates the truthfulness of his work. Wright's book assumes journalistic objectivity but leaves the reader with a sense that it's only one part of the story. In effect, despite its sober, these-are-the-facts narrative voice, it's highly personalised, restricted by its adherence to the notion of 'journalism'. Saviano's overtly individualistic, occasionally demented, scattergun method, and open moral stance (easy when the book's subjects are so, so plain bad)seems to me more trustworthy. Doubt it'll be serialised in The Press and Journal, though! Anyway, Generation Kill is on UK TV from Sunday, on FX. Gomorrah the movie I haven't seen. Thanks to Magnus by the way for giving me Generation Kill for Christmas and Gomorrah for my birthday! Much against the instincts of my inner protectionist hack, may I recommend this celebrity New York Times column by Mr Paul Hewson? Back in November, on my way to a journalistic assignment in Stornoway, I stopped for a delicious bacon roll at the Black Mount, above Rannoch Moor. 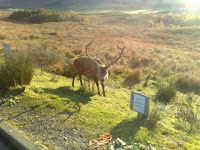 There has been a tame stag haunting the lay-by for a number of years, treasured and protected by locals. I was horrified to be told today by listener Deborah Hackett that the animal was attacked by bunch of inexpressibly disgusting excuses for human beings using an air gun. It was so badly injured it had to be put down. I know that at a time when hundreds of people, including children, are being slaughtered in Gaza (and elsewhere)this may seem like a classic piece of anthropomorphic sentimentalism. But it's a form of casual cruelty-for-fun that always illustrates real evil. 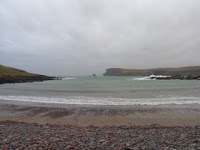 Some scenes from Shetland over the past few days. 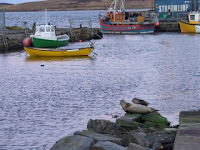 Those seals are just a few yards from the back of the Toll Clock shopping centre in Lerwick. They're virtually tame. 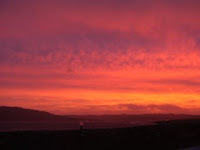 The red sky was at dawn on Saturday (shepherd's/sailor's warning, and how). It was a day of brutal weather. 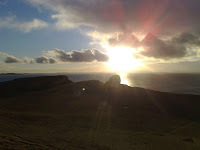 That glint of sunshine shows the community I live in, Hillswick, and in particular the St Magnus Bay Hotel. It's on a narrow spit of land between two beaches, and our house (some 300 years old) is built on what seems to be reclaimed beach. 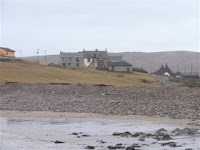 The other picture of the hotel (from the side) is taken from the West Ayre. The 1960s house directly facing the camera is the doctor's house, where we lived in the late 1980s. 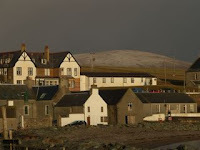 And then there's the West Ayre itself, late this afternoon, as the light was fading. Definitely surfable. As I write, the weather is worsening again. Time for soup! One of my producers referred to the picture lurking below of a piratically-bearded me as "frightening". However, that's not the reason I shaved it off this morning. Nor was I intent on making myself look younger. I don't. My daughter claims beardlessness makes me look "more serious", or possibly just less ridiculous. No, it was done because of the intolerable itchiness and the fact that we had a carry-out curry the other night from the UK's Most Northerly Indian Takeaway (just next door to The UK's Most Northerly Chip Shop). That chicken channa stuck around, literally, far too long. Of course, having reduced my hirsuteness quotient, I discovered that the beard - or at least, facial hair - is apparently going to be the male fashion accessory of 2009. Sting has a beard (I think that stems for a period moonlighting as a Tantric Santa Claus in the Chippenham Woolworths). Brad Pitt has a dodgy moustache. Prince William is sporting what they call in the Royal Navy a 'full set'. This matters to me not a jot, a whit or a follicle. Beards and curries do not go together, and that's good enough for me. Left the assembled revellers revelling at around 2.00am and hit the hay, which appears to have been a wise move. 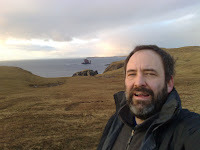 Up at 10.00 am to find a truly glorious Shetland day - flat calm, very mild, sunny - and so it was a hurried clear-up, high-octane, high-caffeine, high-cholestorol breakfast (guests Lizzie and Dave up early too, to go off and feed kye) and then oot and aboot to savour some of that wonderful and all-too-brief light. I'd had a note from an unfortunate Geocacher to say that the cache I'm responsible for on the Ness had vanished, so I thought I'd better check. It's a good 40-minute, very rough walk out to the location (it's called Another Fine Ness if you're into this stuff) but with the conditions, it was absolutely brilliant being out there. On one side the Drongs (that's the cathedral-like stack you can see behind me in the picture) and on the other the lighthouse and a view clear to Nibon. Sure enough, nothing remained of the cache (a Tupperware box). I blame bonxies, black-backs or possibly sheep. It will be replaced within the next few days. I took the short route back, down the spine of the Ness, meeting neighbours Nick and Fiona and getting some of their 'Happy Hens' eggs, which are available for sale at all times and which I thoroughly recommend. So, as I write, I'm preparing the Ne'erday dinner, which will be traditional steak pie and tatties. Just baked some soda bread which marks the first resolution of the year: no shop-bought bread. Back to work tomorrow - today's show, which I thought was really good, was a pre-record.